Visite a cabeça do antigo Império da Prússia numa viagem de meio dia a Potsdam. Desfrute de uma excursão guiada do famoso Palácio de Sanssouci e caminhe pelos seus jardins - durante os meses de verão. Ouça o comentário informativo do seu guia sobre a história do Império da Prússia enquanto passeia por esta cidade listada pela UNESCO e visite atrações como o Bairro Holandês, o reconstruído Palácio da Cidade e o Novo Palácio. Our guide has joined us at the "spy bridge"(Glienicke Bridge) which was used to exchange spy's during the cold war (also featured in the Steven Spielberg's movie Bridges of spies). She had an outstanding commentary both in English and German, We visited Sanssouci palace, dutch quarters and drove close to Cecilenhof . We enjoyed this tour. The guide did not seem too keen to please or answer questions - just wants to get on with her job. She catered mainly to the German-speaking tourists even though 90 of the travellers were English speaking. Taking a train to Potsdam ourselves, in our own time, would have been much better value. 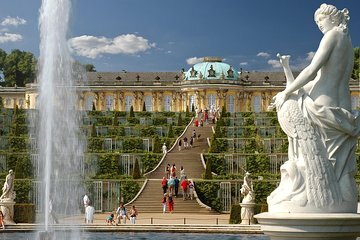 Join this half day trip last week and it was nice short trip from Berlin to Sanssouci Palace. The palace itself is not as big as expected and only a few staterooms are open for guided tour. Not too much free time browsing around Palace though especially one wants to wander in the fountain back garden to appreciate its architecture. We had 1hr free time at Dutch Quarter for food which was ok. If this trip can be 1hr longer (for free time), it will be perfect. Potsdam was beautiful and so was Sanssouci Palace. However, the tour was very overcrowded. It was difficult to hear the tour guide who was doing a good job, but there was a lot of us. Also, the Palace made an exception to let the whole group in at once and it was incredibly crowded. They allowed pictures, so everyone was distracted and trying to maneuver around the whole time. This was a complete waste of time and money. of the 4.5 hours of the tour, we spent 2.5 hours on the bus--getting in and out of Potsdam. Tour guides did not seem to know there was a marathon in Potsdam which caused delays and a bike race in Berlin which lengthened our return trip. Additionally, the tour guide announced that the tour was bi-lingual--in German and English. This was NOT advertised, and only two of the 26 people on our tour spoke German. The tour guide was knowledgeable, but too much time was wasted giving information in both languages. As a result, we got to spend very little time at the Palace or on the grounds. We would tell friends to just take the S baum from Berlin to Potsdam for under 5. No need for this very disappointing tour. Too much time on the coach, too little time pausing to see things in more detail. Pretty place. The guide spoke low, so you had to be net to her to hear anything, really lackluster. I would definitely recommend going to the palace, but not with that tour group. Thought I did review this one: arrived at allotted time, 10am only to be told tour wasn't going Not happy, not impressed. They didn't bother to inform me so I could make other arrangements. By 10am too late to book anything else. Bex Sightseeing was the name of the company, avoid them!! Don't think I should be giving them a one star but the system doesn't allow for no stars. Very enjoyable. A shirt coach trip though Potsdam with an interesting commentary. Visit to Sansoucci was the highlight.